According to researchers at the National Marriage Project, marriages dissolving over money issues have risen dramatically in the last year or so. Read the statistics and it's clear. 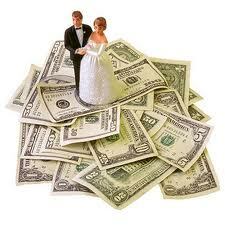 Couples who argue about finances one a week are 50% more likely to divorce than those who do so only once a month. Newlyweds who run up their credit cards spend less time together, fight more and are unhappier overall than those who manage their plastic spending. Couples with $10,000 in financial assets, such as savings, investments and a home, are 70% less likely to divorce than those who do not have assets. This could be because they've learned to manage money in order to acquire these assets and it's difficult to split up and figure out how to divide assets acquired during marriage. While it's no secret that we're in the middle of a deep recession, there still doesn't seem to be an end in sight. Because of that, it's now become even more important for couples to communicate about money issues and try to resolve them before it leads to the dissolution of their relationship. One way I found to stay on top of my finances is with new online and mobile budgeting applications. They are free and require little work on your end. Mint and Money Strands are two secure applications that provide secure SSL encryption on their site to protect your financial information. Money Strands even has 24/7 CCTV surveillance at their data center to protect you from any information intrusion. Money Strands is an application that lets you track expenses with the push of a button on your smart phone! It was developed to help you take control of your finances, save money and all while not having to spend a dime on financial software. Money strands pulls together data from your checking, savings, credit cards and loan accounts to provide an accurate, up to date picture of your financial life broken down by category. They provide a mobile widget that gives you immediate access to all of your financial data anywhere, anytime. Check balances & receive text alerts on the go. They make money by working with third parties to bring deals, coupon offers, financial products and more to its users. Money Strands can be used online or on your mobile phone and you can cancel with them at any time if you wish to do so. When you do, all of your information will be deleted. Mint is similar to Money Strands and provides budgeting software online to help you set and stick to realistic budgeting goals. Mint will show your financial portfolio alongside your checking, savings and loan accounts so you can see a complete picture of your account. After adding your accounts, Mint immediately pulls balances, purchases, stock trades, etc to give you a complete picture of where you stand financially. It connects securely to nearly every US banking financial institution that has internet banking capability, saving you hours of tedious data entry into expensive budgeting software. It also updates all of your account information automatically even while you're not logged in. You always have access to the most current information available to you for all of your accounts on one site.. Mint uses SSL encription and 24/7 security at their data centers. They are a read only service and no transfers within are possible so your money is secure. They don't ask for your name or any personally identifiable information that would put your accounts at risk. In addition, they notify you of possible fraudulent transactions on your inputed accounts. Before these websites and applications came along, you were required to pay upwards of $100 for budgeting software. Even after spending that, it was up to you to regularly update the information and keep your balances up to date in order to maintain an accurate, current picture of your finances. With Mint and Money Smart, the work is done for you and it's all for free. You and your spouse can log on to both of these budgeting sites and see exactly where you stand any day, any time. It's worth a try and it very well could save your marriage!